While Governor Deval Patrick is taking care of business abroad, House Speaker Robert DeLeo unveiled his own version of an economic development bill that, unlike the governor’s, doesn’t call for dissolving non-competes in Massachusetts. During a press conference on Tuesday afternoon, State Representative Joseph Wagner, chairman of the Joint Committee on Economic Development and Emerging Technologies, said that while there are many similarities between Patrick’s and DeLeo’s proposed legislation to help bolster the state’s technology and innovation sectors, the House Speaker’s does not include a provision that would bar companies from forcing their employees to sign non-compete agreements. He said more broadly, it struck him that there were more things before state legislators that they considered a greater priority than getting rid of the contractual obligations that can tie employees to a company for months at a time, even after they put in their resignation. “If we look at this issue going forward, it’s not going to be we have noncompetes as they exist, or we ban noncompetes. There is clearly some other place, potentially, but we are not even close to that. But I think that’s a dialogue for another day, and to try and have it in the context of this bill with the time remaining would set us back on a number of fronts,” Wagner said. Elected officials have until July to push through some type of economic development package before the fiscal year comes to an end. DeLeo did not directly address the fact that banning non-competes was not part of his economic development package. When Boston reached out to DeLeo’s legislative aide, they referred to Wagner’s statements on the matter. In April, Patrick set forth his own bill, called “An Act to Promote Growth and Opportunity,” which included ways he hopes to invest in education, innovation, infrastructure, and business growth. As part of that proposal, Patrick included an amendment that cast a damning light on the contracts that many workers in the tech and science sectors are asked to sign when starting new jobs. Those who disagree with non-competes claim they often stifle innovation, because they limit the ability to branch off and start new businesses, and cause people to shy away from jobs in Massachusetts, seeking employment in states that don’t have as aggressive contracts. As it’s written in Patrick’s plan, any contract—whether on paper or verbally agreed upon—arising out of an employment deal that prohibits and restricts a person’s ability to seek any type of similar opportunity, once they leave a job, will be void and unenforceable. The measure garnered support from Boston’s tech and investment sector as entrepreneurs have stepped forward to demand that creative thinkers with bold ideas have the ability to branch out and create new businesses without being tied down by a former employer. 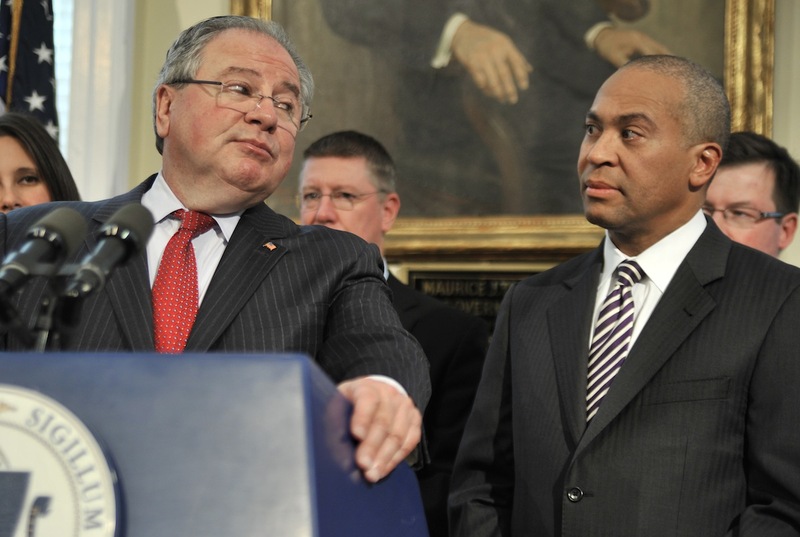 While Patrick’s bill had the backing of many people from the tech community, DeLeo’s did, too. In attendance when he unveiled his plan on Tuesday were representatives from the Mass Technology Collaborative, MassDevelopment, Mass Technology Leadership Council, and Google. Although the issue of non-competes was a point of contention, DeLeo’s bill does address a range of other issues. According to his proposal, if passed, the House Speaker’s bill would pump $1.5 million into MassCAN to establish a new computer science education program in public schools, and would create the Big Data Innovation and Workforce Fund to promote big data and analytics industries.